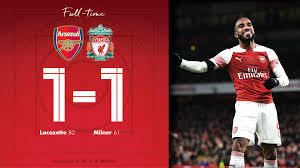 Liverpool manager Jurgen Klopp to BBC Sport: “A point is a good result – Unai Emery can say the same, but we had clear chances. When Arsenal chase the game they throw everyone on the pitch which is really cool and we were not as compact as I wanted. Arsenal manager Unai Emery speaking to BT Sport: “We wanted to win but the performance is good, we push and we work the match, doing our tactics and with our supporters pushing us with energy. For the supporters it is a great match and a good spectacle but I am only 50% happy because we wanted to win. Arsenal host Sporting Lisbon in the Europa League on Thursday (20:00 GMT), before playing Wolves at Emirates Stadium next Sunday (16:30 GMT). Liverpool travel to Serbia to face Red Star Belgrade in the Champions League on Tuesday (17:55 GMT), before taking on Fulham in next Sunday’s lunchtime kick-off (12:00 GMT).